Before the French Revolution, organ builders often settled in episcopal capitals, where they could count on the many convents clustered around the cathedral as potential customers. On the left bank of the high Rhine valley, the city of Strasburg attracted prestigious builders like the Silbermanns. The city of Baselcould not exert the same attraction due to the Reformation, which had driven its bishop to Porrentruy and its chapter to Freiburg im Breisgau, and then to Arlesheim. This is why organ makers who wanted to work in the Basel bishopric, which then included the southern half of Alsace (now the Haut-Rhin département) settled either in the Swiss Jura, at Porrentruy and Saint-Ursanne, or in Alsatian towns, like Ammerschwihr, Ensisheim and Kaysersberg. Around 1700, Joseph Waltrin (1679-1747), the son of an organ maker from the Vosges, settled in Porrentruy. He went to Saint-Ursanne as soon as 1703 in order to transform the organ of the collegiate church, which had been built in 1620 by Thomas Schott, an important Helvetian organ maker whose work remains in Muri and Rouffach. 1984 by Hans-Jakob Füglister, who reinstalled the original composition and the three cuneiform bellows. However, the new elements had not been copied from early models of Dubois and Besançon’s school. During the second restoration made in 2004 by Bertrand Cattiaux, the five reed pipes, the cymbal, the keyboards, the pedal-board, the pedal action system and the rackboards were renewed and the harmony of the instrument was corrected, with a new unequal temperament. 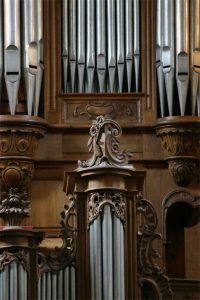 The organ of Saint-Ursanne thus became once again one of the most precious testimonies of 18th century Alsatian organ-making, and certainly one of the most endearing.